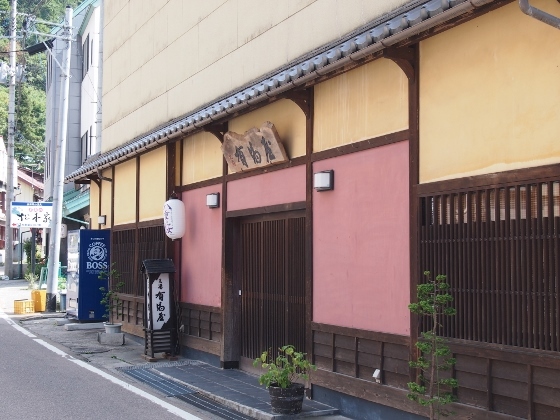 Today, I left Ashinomaki Onsen and pedaled on the Aizuwakamatsu Atsushio-Onsen Cycling Road to Aizuwakamatsu City area, and the final goal was Higashiyama Onsen nearby. Fukushima Pref. 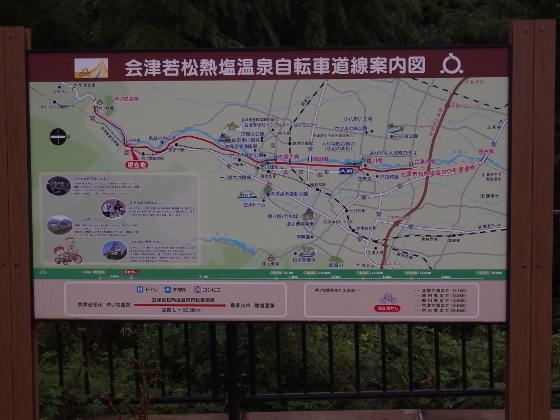 made this Cycling Road which connected Ashinomaki Onsen and Atsushio Onsen which was 50km distant. This road enables bikers to pedal safe even in rainy weather, and I greatly thank for this. 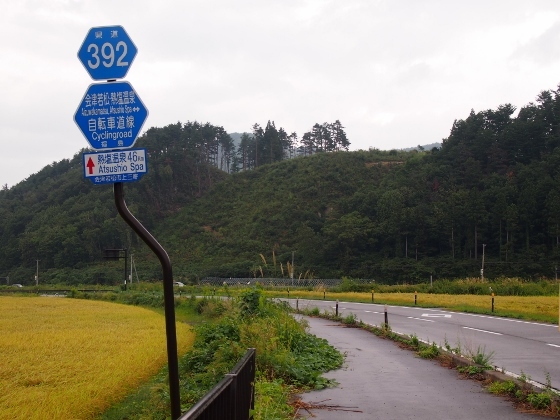 The first picture is the sign of the Cycling Road, and the second picture shows the road sign and the view on the way. 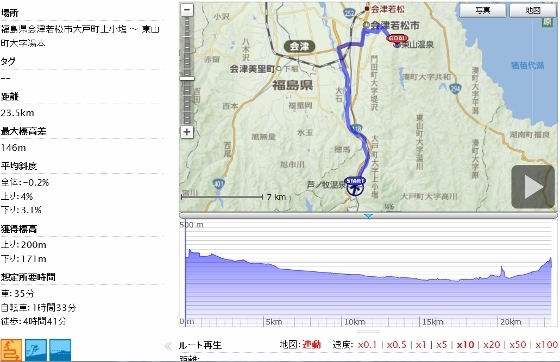 As shown in the GPS log above, most of the route was downward, except the last entrance to the Higashiyama Onsen. I visited Tsurugajo Castle in the Aizuwakamatsu City. 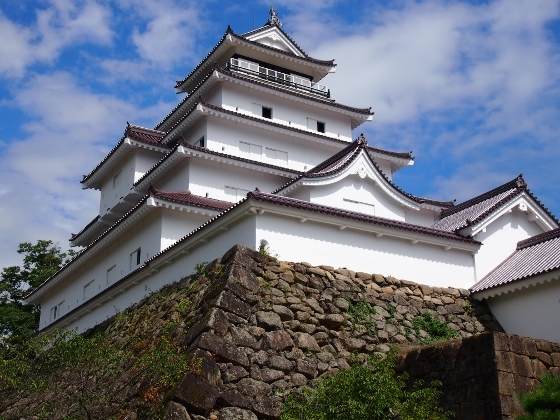 This Castle had been famous for as much as eight Load Families owned this Castle era by era during about 500 years. The Castle was destroyed in 1874 but afterwards reconstructed. 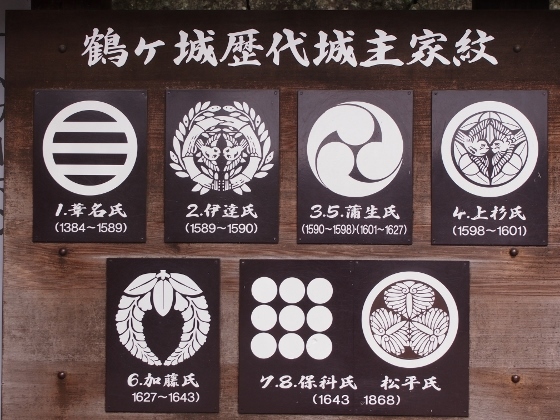 Pictures show the elegant figure and the eight Family Crests of the Castle Loads. Today, the sun appeared only during my visit to Tsurugajo Castle. Tonight I stayed at Arimaya Inn shown in the picture above. The natural hot spring of 48 degree Celsius was flooding from the bath as it was. It was a good chloride spring. I could keep my bike inside the house safely.